Frogs and water go together better than peanut butter and jelly. Even desert-dwelling frogs have a special relationship with water. 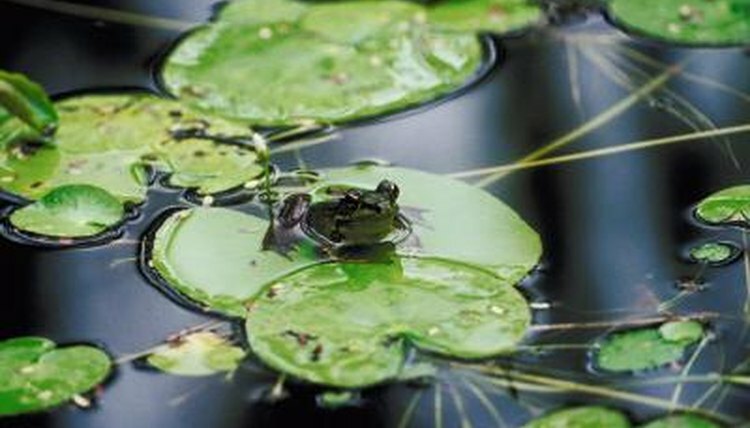 All animals need water, of course, but a frog's life depends on constant access to moisture. This makes his skin well adapted to life in an aquatic environment, even to the point of taking over the functions of some internal organs. A frog has lungs, but gets most of his oxygen through his skin and uses his lungs only when he's active above the water's surface. Since his skin can absorb oxygen from the air and water, he can breathe in both environments, allowing him to dive and swim as much as he wants without worrying about his oxygen supply. Besides absorbing oxygen, a frog's skin can expel carbon dioxide, which means it is a complete respiratory organ separate from the lungs. Skin permeable enough to let oxygen in also is porous enough to lose moisture quickly. If he's out of the water for too long, a frog literally can start drying up on the inside. With the exception of a few desert species, a frog's skin is designed to be in water frequently, so that he doesn't dehydrate. Despite all the time he spends swimming and basking in the shallows, a frog doesn't open up his mouth and take a drink. Instead, he absorbs water right through his skin the same way he takes in oxygen. While most frogs must be at least partly submerged in water to do this, some frogs can get the water they otherwise would need to drink from moist soil or morning dew. Secretions, or mucus, that covers a frog's skin in a slimy coating keeps him moist and deters predators, but it also provides some protection against water-borne illness. Since a frog gets much of his oxygen, as well as his hydration, from the water where he lives, bacteria living in the water can quickly harm his body. The composition of the secretions varies among species, but frog mucus often contains components that can kill viruses and bacteria. While this doesn't save him completely from badly polluted waters, it offers up a defense against illness, fungus and viruses found in his aquatic home. Cornell Centers for Materials Research: Archives of Ask a Scientist!